Fabric is first quality. Great product for the price. 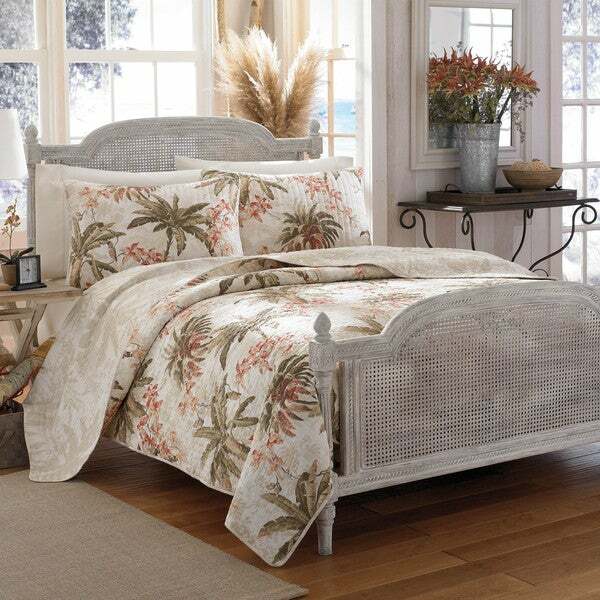 If you can't be on the beach constantly, have the next best thing with this gorgeous Tommy Bahama bedspread, which features a calm tropical design and neutral, relaxing colors. Lie down and immerse yourself in the soft, breathable cotton as you dream of the salty breeze and the sound of distant seagulls. This Tommy Bahama quilt spread is not only beautiful, but very generous in size.. I just love it!! Very well made! Love, Love, Love this quilt!! I was debating between this another quilt. My initial drawback was that the quilt would become lost in the creme-colored room but I ordered it anyway because the I felt the pattern would blend nicely with other accessories in the room. I was so pleasantly surprised as it was perfect! The colors were not as muted as they seemed in the photo. Love the quilt and have actually considered ordering a spare to keep on hand as is being used in a beach rental. Would definitely recommend! Beautiful and well made, but if you have a deep pocket mattress, it might not cover completely. Mine is about 16” deep and my King size quilt is about an inch short of covering the sheets on either side. It is plenty long enough however. Still, It’s so good looking, I consider it a great find! Love the quality and the colors! I shrank a little, but I still love ti. 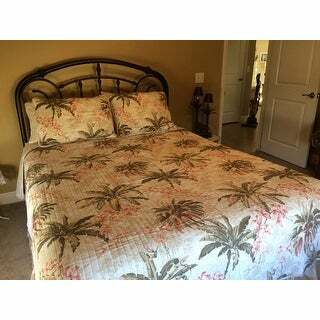 Recently purchased this set in Queen size. Great fit on our bed. Nice quality, good colors. Looks as good as I'd hoped. I had my eye on this for 1 year and finally decided to pull the trigger and order it. It's the right weight and warmth for us, good quality and it really gives our bedroom the island and tropical feel that we were looking for. I'm thinking of buying a back up set for the future because I love it so much! I saw this quilt in my daughter & son-in-law's home and just had to buy one for myself! I love the touch of pink-coral in the print without making it too "girly". Great for the vintage tropical look I was going for. Love this quilt...very nice quality and very pretty too! Exactly what I was looking for. Love the colors of this 3piece set. The shams are a little lighter weight than I like but will be fine with the perfect weight of the quilt. This set will work quite nicely at our beach condo since the master bedroom has a tropical feel. Very pleased. Well made and attractive. Great quality, colors are exactly what I expected and what I was looking for! Lovely, reversible, lightweight coverlet quilt that is perfect for So.Cal. Love the design, but not the best quality as to stitching and finishing details. Had to go over several areas to ensure no unraveling will occur. At the price paid for something with Tommy Bahama name, expect much better quality. This is a well made, light weight quilt. It is going to be PERFECT for the summer months. Looks exactly as pictured, glad I purchased. Good quality. This item is (at least on our computer) has colors that are well represented by the photo on-line. The fabric etc. is as described. Our King mattress is 12" in height, it almost covers it. The length is more than enough to cover and tuck in pillows. Really like the way it fits on my king size bed. It's nice and light weight for our warm climate. The downside is that the shams are rather large and the king size pillows I have do not fill it out. Also I was expecting more of a coral color and it is on the pink side. What's not to like about Tommy Bahama quality at a steal of a price? Oversized cal king fit bed excellently. Matched the shower curtain perfectly. Really made our master bedroom/bath come together. "Hi, I would like to buy an extra sham, for a twin set so that I'd have 2 total. Is there an option to purchase an extra sham??" Unfortunately, we do not sell the shams separately from the quilt set. "I am planning to use a bedskirt with this quilt. ITEM# 19965269 on this site. It is available in white or beige. In your opinion which would look better?" Yes, the bedskirt you are referring to is currently available in different color options. I would recommend the beige option with this set. "In your opinion would this quilt look ok with white furniture. Is there any white in the background"
Absolutely! We live in Florida and have a lot of guests from up north looking for that "Tropical" atmosphere, so my husband and I painted a brown wicker twin bedroom set all white and then put these quilts and shams on. We then bought some flamingo paintings which match the color of the flowers in the quilt. It looks beautiful and our guests love it! Yes, there is white in the background. 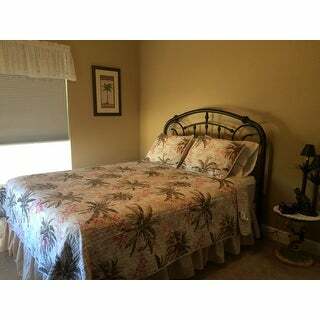 We also bought olive colored sheets to match the palm leaves in the trees. I too live in FL and love this because of the tropical color theme. In my opinion, the background is more ivory rather than pure white. My bedroom set is dark cherrywood and the contrast works well. "How can I buy just the Bonny Cove pattern pillow shams? are they available anywhere?"